None of this rigamarole stops us from being regularly skunked, cause for serious lamentations from my beloved. And even when we do hook a fish, there’s no guarantee we’ll land it – very tricky on Receta, which lacks a swim platform or wide side decks, and whose small aft deck is cluttered with safety gear, the poles of our wind-generator, and the outboard engine for our dinghy. But every once in a while we have a very good day. Like Monday, sailing from Les Iles des Saintes, Guadeloupe, to Portsmouth, Dominica. Within seconds of each other, both fishing lines screamed off the reels. 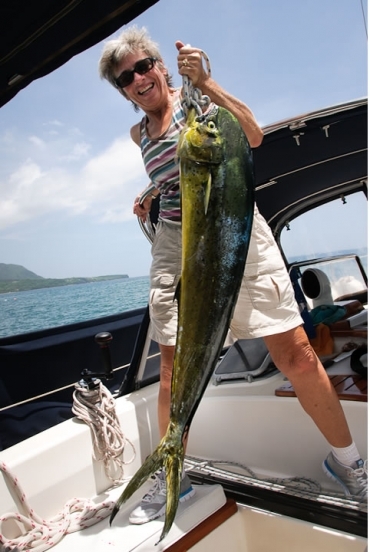 The fish on the port line jumped, making it clear we had hooked two dorado – a.k.a. dolphinfish or mahi-mahi. We went one for two. The mahi we landed was a female just a hair shy of 4′ long; we didn’t have a scale to weigh the whole fish, but it yielded 8 lbs of gorgeous fillets. We played the other one (a male, considerably larger) for an exhausting hour. We reeled, it ran; we reeled, it ran — until he finally shook the hook right alongside the boat. There were lamentations from my beloved, of course, but it was hard to take them seriously. That night we invited our friends on Arctic Tern and Daniell Storey for pan-fried mahi and coconut rice and beans. The next day, we gave a bag of fillets to our Dominican boatman friend Martin. He reported that he cooked them for his family in a Creole-style court bouillon, steaming them in a sauce of well-seasoned coconut milk. I cooked the fish that way last night for Steve and me. For Steve, the pan-frying was his favourite by a fish flake; for me, it was the coconut court bouillon. I’ll post the recipe soon.